(The Asahi Shimbun, August 12, 2016) The Japanese film “Aozora Yell” (Yell for the Blue Sky), which will be released soon, is set at fictitious Shirato High School in Hokkaido. “Aozora Yell” tells the story of a friendship of encouragement between a female member of the school’s brass band and a boy who is a catcher for the school’s baseball team. In the band’s practice room, a flag saying “Isshin Furan" (Total Devotion) hangs on a wall. The message is that realizing your dream requires practice with complete devotion. Members of the band practice with really serious expressions on their faces. The school in the film is modeled after Hokkaido Sapporo Shiroishi High School, a prefectural school well known for its excellent brass band. Yukiko Umetsu is a graduate of the school and played the bassoon in the band when it won the national high school brass band championship. For a highly competitive high school brass band, cheering for the school’s baseball team is an honor, but it can also be a burden. The summer high school baseball tournament season coincides with the period for qualifiers for the national brass band championship. 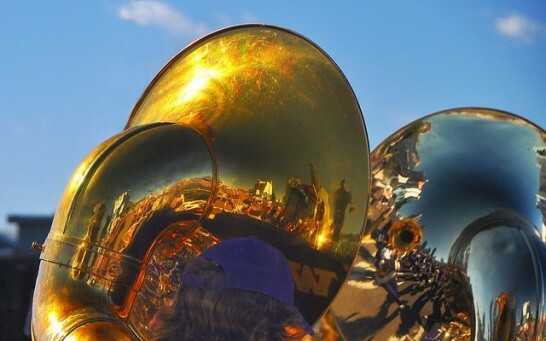 Cheering at a ballpark for the baseball team exposes band members to the scorching sun and sudden showers, which can damage musical instruments. Hours of almost continuous playing can tax a brass player’s chops and stamina. Still, many brass band members yearn for an opportunity to play for their school’s baseball team at Koshien Stadium in Nishinomiya, Hyogo Prefecture, the venue for the national high school baseball tournament. Umetsu was amazed at the zeal with which brass bands perform for the school baseball teams, apparently feeling a sense of unity with the players. Umetsu played with high school musicians, recorded the hidden stories behind the origins of famous cheering songs and studied the 100-year history of brass band performances at baseball stadiums. Her research led to a book titled “Bura-ban Koshien Dai-kenkyu” (A comprehensive study on brass band performances at Koshien). In the band community, the stadium performances of the brass bands of Tenri High School in Nara Prefecture and Takushoku University Koryo High School in Chiba Prefecture are held in great esteem. The two bands have their own original cheering tunes and boast high levels of performing skills. The brass band of Narashino City Senior High School in Chiba Prefecture is known to play with high “sound pressure,” which is said to turn a ballpark into a concert hall. The summer Koshien tournament can never be complete without school brass bands performing with total devotion under the rays of the burning sun.